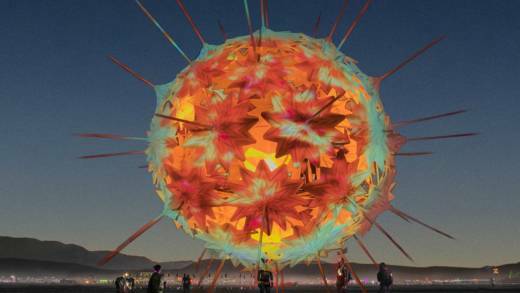 "It’s the kind of art that you almost need Burning Man to inspire. It’s so audacious and also whimsical at the same time," says Jesse Silver, a VP of product at the cannabis company Pax and one of the leaders of an army of roughly fifty volunteers who call themselves FoldHaus. Who are they? Bay Area designers and engineers — many of them connected to the design firm IDEO. Like Joerg Student, an executive design director and the other FoldHaus lead. "All of our sculptures are somehow inspired by nature. Like, we did flowers [Blumen Lumen], and then we did mushrooms [Shrumen Lumen]. This year, the inspiration comes from this tiny protozoa called radiolaria that floats in the ocean," Student says. 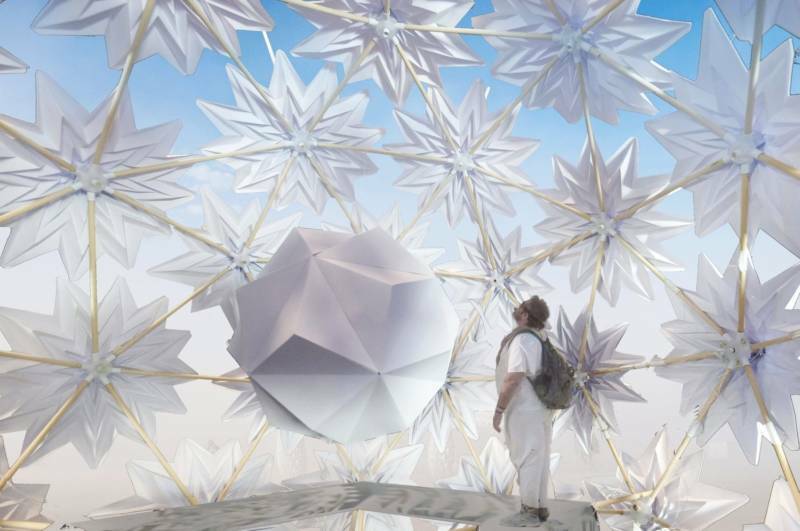 Once the FoldHaus team settled on a type of radiolaria, a huge amount of creativity and sweat equity went into turning the idea into reality. "I think each of our projects builds on the last one," Silver says. "It would be almost impossible to come out here and build anything like this as a first time Playa artist. Our ability to make something of this complexity level is just because we've done the mushroom project before and the flower project before that." Silver continues, "There are so many subsystems that are so so complicated and just so intricate. So there's a team of people that just worked on computer systems and interaction, and a whole team of people that worked on power and wiring, and a whole team of people that worked on construction and structure. So it's the first time we've built a project where I'm actually not sure if there's any one person who really knows all of the details." There are even volunteers whose contribution will be watching over the sculpture to keep people from damaging the work. "It's very unlikely someone would deliberately do something malicious. But the worry about this structure is mainly that it looks very climb-able. It's essentially a geodesic sphere with all the struts and you kind of want to just grab onto one and scale it," Silver admits. That said, RadiaLumia is interactive. There's a platform inside, where visitors can climb up to get an inside view. Sensors built into the panels within reach of people on the sand tell the computer running commands to generates new patterns. The intent, after all, is to incite delight, Student says. "Wow! It's beautiful, and then it starts moving, and then [people] scream out loud. Which makes us happy."